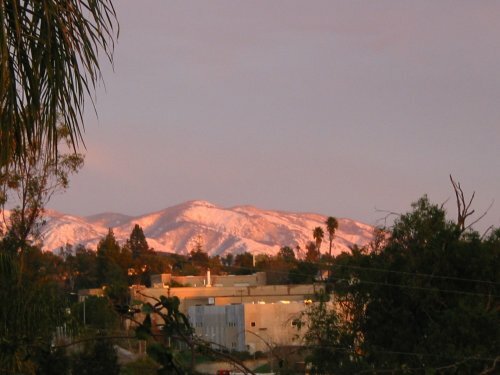 It turns out that this Snow on Mt. Palomar, back on December 9, 2007, was nothin’. But you couldn’t have told me that three days ago, when our high temperature was about 80 degrees Fahrenheit, and I was certain spring had sprung with a summery vengeance. I almost tucked away my warm clothes and pulled out my summer shorts. There was no more snow on Mt. Palomar. It had all melted since around Feb 5th, when the mountain didn’t boast nearly as much snow as in early December. 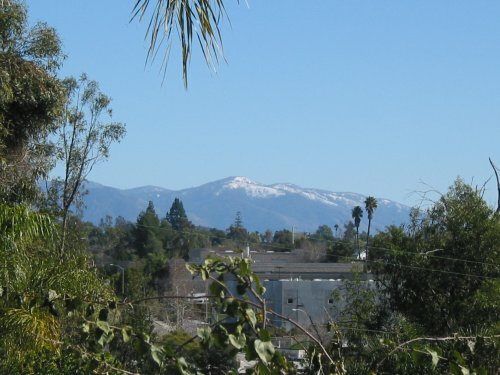 I did get a nice view of the entire mountain with snow on it, from our polling place on the 5th. But I didn’t have my camera with me, so this view was from our yard. As you can see, it wasn’t as much as in December. And like I said, by three days ago that was gone, melted. History. But I’m glad I never got around to putting away my sweaters, because yesterday I don’t think the outside temperature ever rose above 50 degrees, and although the forecast had called for a light drizzle overnight, instead we got dark, threatening skies, cold wind, and steady rain for several hours yesterday. I was sure that once the clouds parted there would be a fresh layer of snow on the mountains. But when they did, I couldn’t believe what I saw. Here’s our view just as the clouds lifted yesterday afternoon. 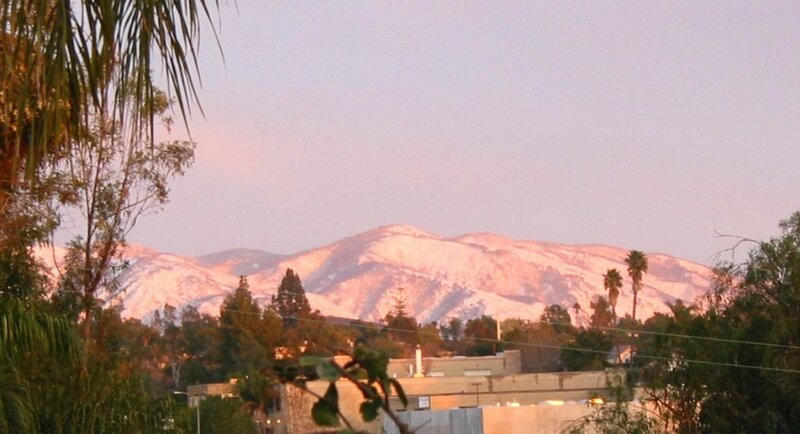 Below shows our view from our side yard at just around sunset yesterday, when the snow reflected the setting sun. We can only see the lower, southern peak from our side yard, and that’s possible only in the past few months since we removed some obstacles. Below is a view of the entire mountain, from the vacant lot two houses down the hill, this morning. 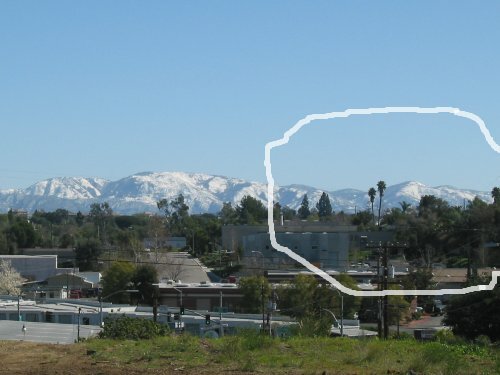 I’ve circled the portion visible from our yard in the second view below. I don’t mind a little warm weather, and I don’t mind a little cold or rain. 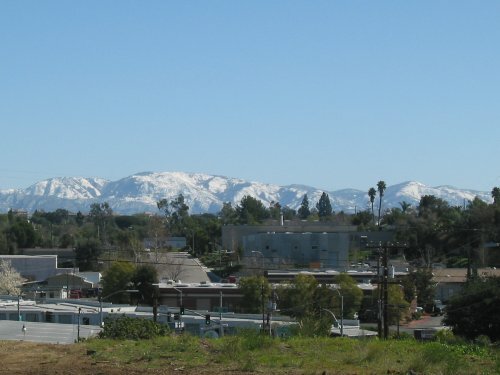 We can always use more rain around here, and snow is beautiful from a distance, but this snow looks more like Washington, Idaho, or Sierra snow than Southern California snow. Okay, maybe it’s like Big Bear snow. But it’s not normal San Diego County snow. We had roads close near Campo yesterday, which is near the Mexican border! Is it possible the entire region shifted north and we didn’t know it? It’s confusing, and I guess it’s time to dress in layers for a few weeks. 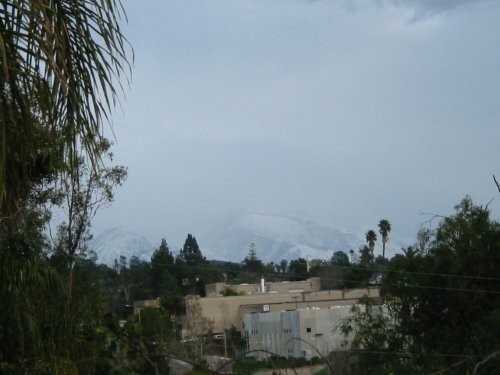 ‘Slider’ brings rain around county, snow in moutains. See what happens around here when it snows? People get stranded, roads close. Just a little snow can set us upside down and sideways. It’s not supposed to snow here. We got quite a bit of much-needed rain last weekend. This week’s storm didn’t bring as much where I live. I think the storm dumped most of its moisture on Oregon long before its tail end reached us. 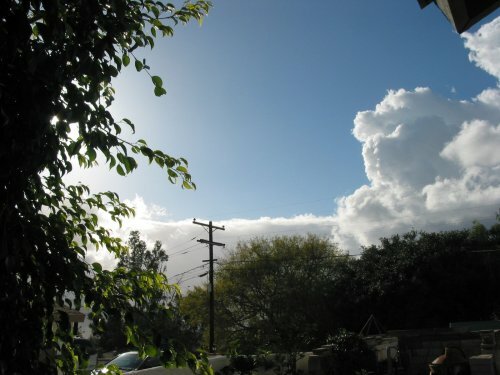 But yesterday afternoon, clouds moved in from the west again. It wasn’t exactly sunrise, but the sun’s debut for the day. After a soft, steady rain all night and continuing into this morning, I got up to raise the heater setting and found the dog curled in a tight ball in the back corner of his bed. He didn’t stay outside very long either. We are all wusses here in So. Calif. when the temperature dips. It dipped to 35 or so degrees F last night, outdoors. When the sun first peeked through the clouds in the east, rain continued to fall, and the sun outlined everything in sight with silver. I’m sure there was a rainbow. I couldn’t see it from my window. The world was brilliant, shiny, a jewel, in those few minutes. Of course it’s always a jewel. We just tend to let our view of it get dusty.